Syrian President says countries that want to reopen embassies in Damascus must end their support for Syrian rebels. Syrian President Bashar Al-Assad said Sunday that countries that want to reopen embassies in Damascus or resume ties with his government must end their support for Syrian rebels. "We are not isolated like they think, it's their arrogance that pushes them to think in this manner," he told members of Syria's diplomatic corps, according to AFP. 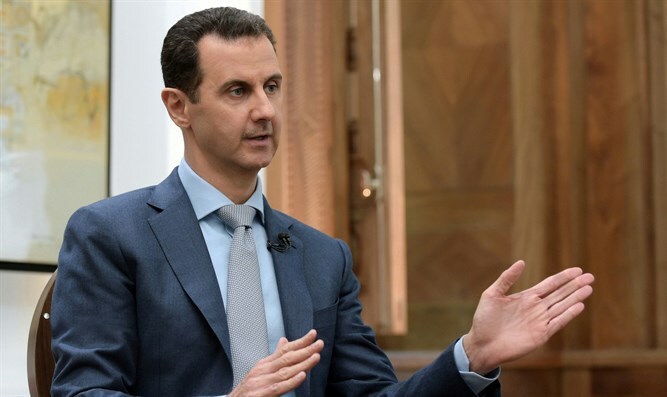 "There will be neither security cooperation, nor the opening of embassies, nor a role for certain states that say they want to find a way out (of Syria's war), unless they explicitly cut their ties with terrorism," added Assad. Syria's government refers to all those who oppose it as "terrorists", including both jihadist rebels as well as rebels considered by the West to be “moderate”. The United States and most European countries shut their embassies in Damascus after the government's bloody crackdown on protests that erupted in March 2011. Ties have remained severed throughout the brutal civil war that followed, which has since killed more than 330,000 people. In recent months there have been reports that Western countries could be seeking to quietly resume ties, including France under new President Emmanuel Macron. He stressed Syria should no longer look to the West but rather "turn politically, economically and culturally to the east," in reference to the government's remaining allies. Assad renewed his criticism of Turkey's President Recep Tayyip Erdogan, who has long backed Syria's uprising and called for Assad to step down. "We consider Turkey to be neither a partner not a guarantor and we do not trust it,” said the Syrian President, who described Erdogan as a "political beggar, who seeks to give himself any role". Erdogan has continuously been openly critical of Assad. He several times called on the Syrian President to resign and, in August of 2013, he said that the goal of any military intervention in Syria should be to topple Assad’s regime. Last year, however, Turkey appeared to soften its stance on Syria, with Turkish Prime Minister Binali Yildirim saying his country is willing to accept a role for Assad during a transitional period. Assad regularly accuses Israel of supporting the rebels trying to topple him.